In my last Adventures in Food post, I mentioned that Tumeric and Garam Masala were my first Indian spice purchases that were new to me. Now, I’m going tell you how to break into a new cuisine– you know, the food you love to eat in restaurants but think its too difficult to make at home. I really like Indian food, and after flipping through a few Indian cookbooks it seemed to me that Garam Masala & Tumeric were two of the core Indian spices (though of course this varies by region but we’re talking basic here). I already had and use ground cumin, so no need to purchase anything new there. After deciding that I would make some sort of tumeric–garam masala chicken dish, I began looking for Indian or specialty stores that would carry tumeric and garam masala at a reasonable price. My search ended with at a local Indo-American Convenience Store (the same location where I purchased the infamous naughty tomatoes). Happily, this was very close to a friend’s house so I knew the area quite well. My first visit was a little intimidating– most of the items are in another language and look unfamiliar. To acclimate myself to these foreign treasures, I took a slow walk around the store, starting in the rice and packaged foods, then onto refrigerated items, and then finally ending up in the spice and legume aisle.I planned to purchase a package of Garam Masala and tumeric, but I was distracted by the rainbow of lentil varieties: Oily, split, yellow, red. I indulged my desires and picked up the 2 pound split red lentil variety. On a later trip, I purchased split yellow mung beans in an effort to branch out of my ‘rut’. Moving on to the wall of spices, I allowed myself to get lost in the smells and names. Aamchur (sour mango powder). Choti Elaichi (Green cardamom). Ajwain (Thyme Seed). 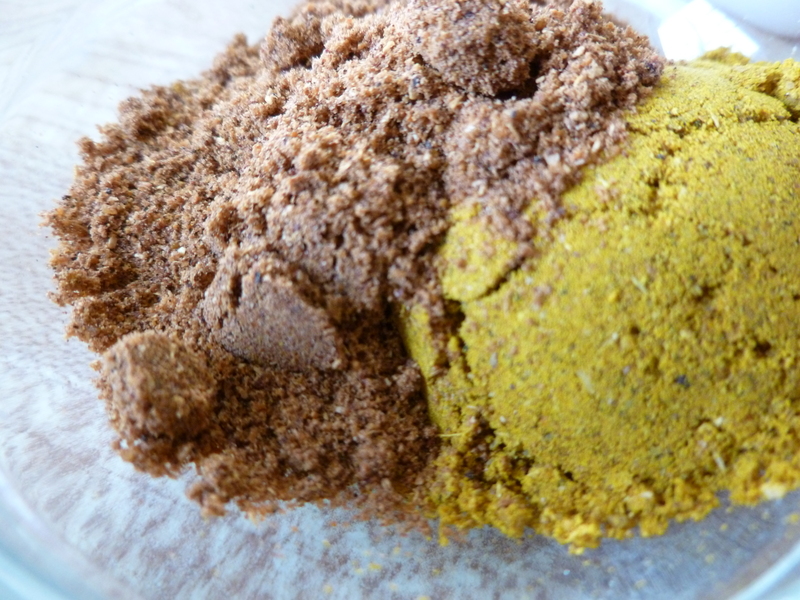 Asafoetida.Jaiphal (Nutmeg). Even spices I know and love took on an unfamiliar air with their imported packaging and Hindi names– and that is one of the bigger hurdles to overcome when venturing into a new cuisine: the vocabulary. Many of the Indian cookbooks I checked out from the library were “Intro” books, which was great because they contained copies explanations and definitions, often with a glossary of terms and substitution notations in case the ingredients are unavailable where you are. My advice to you is just to read as much as you can about your new cuisine to acclimate yourself to the core flavors, cooking methods and techniques. When you finally bring your pile of treasures to the cashier, be sure to chat them up to find out how they use the items you’re purchasing. The gentleman who rang up my mung beans told me that he likes to eat them plain, after they’ve been pan toasted. I’m looking forward to trying that! 1. Go to your local library and peruse the books on the cuisine you’d like to explore. If they don’t have any on the shelf, use their online catalog or ask your reference librarian to help you find cookbooks for that region. 2. Read those books! Flip through the books you found and mark any recipes that look tasty. Then, go back through the recipes you marked and review their ingredients and special cooking materials. 3. I would recommend selecting recipes that only use 1-2 core ingredients that you don’t already have on hand (assuming that you have a decently stocked pantry with your native spices & ingredients). Good beginner/intro to cuisine cookbooks will note where an ingredient is not essential or a replacement that is likely to be found in your country. Or, search the web for a conversion table like this one for Indian spices. In addition, keep an eye out for notes like: advanced, hard, 1-2 hours, etc. You want to start off with something relatively easy while you’re still learning. 4. Focus on recipes that use cooking instruments you already own, or get creative about ways to use what you have for the purposes described. E.g. a deep frying pan instead of a wok. There you have it– the Bread and Butter Method to Exploring a New Cuisine (without breaking the bank or losing your sanity). Let me know how it works for you! Share your experiences below. Apparently, a number of readers have found my site by searching for Kurkure. I feel a little bad that I only have one post relating to that taste exploration, so I’ve decided to share this video my bf found with you. I’m not sure that I get all of the subtle cultural references, but enjoyable nonetheless! Be sure to check out some of the other Kurkure commercials- like this one featuring a flaming Kurkure consumer or this one where the prodigal son returns to eat Kurkure on a horse.